Zimbabwe produced passages of impressive Test-match attrition, but let themselves down with the odd moment of madness, allowing Daniel Vettori to give New Zealand a decisive advantage midway into the evening session. Zimbabwe were bowled out 113 runs adrift in the first innings, but clawed back towards parity with two early blows in the second dig, leaving New Zealand effectively 141 for 2, with two days to play. Zimbabwe could have been in a far better position if they hadn't gifted away three big wickets on either side of lunch. Two of the culprits - Vusi Sibanda and Brendan Taylor - had looked in control until their respective moments of indiscretion, after seeing off an incisive opening burst from the seamers. Their largesse, however, reduced Zimbabwe to a dodgy 198 for 5, before Malcolm Waller reprised his father Andrew's feat of scoring a debut fifty in Bulawayo to haul them past 300. 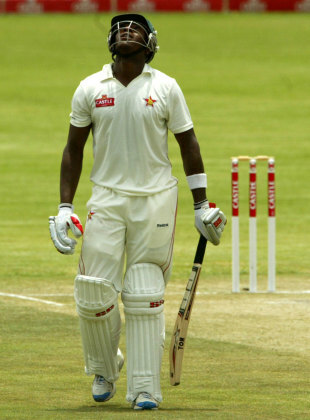 Sibanda, out seven short of a maiden ton, was the only man to miss out on what turned out to be a day for milestones. Waller's was the most unusual feat of the lot, but Vettori's 350th Test wicket, Chris Martin's 200th, and Brendan Taylor's fourth successive score of 50-plus on the tour kept the statisticians working overtime. Martin and Doug Bracewell began the day with tight lines, getting the odd ball to shape in. In the second over of the day, Bracewell sneaked one in sharply enough to disturb Hamilton Masakadza's off stump as he shouldered arms. Sibanda was more watchful, getting across to cover the line and play as often as possible. The first five overs of the day yielded only two runs, before Sibanda shook off the lethargy with two pleasing drives. Taylor endured a thorough test of his technique, as the seamers preyed on his tendency to defend without getting fully forward. Martin had him inside-edging a sharp inswinger, while Bracewell cut him in half with another one that cut in. Taylor was also troubled by a couple of short balls, before easing into gear with a pull shot for four. That boundary signalled the end of the fast bowlers' opening spells, and the pressure visibly dissipated. Sibanda welcomed Jeetan Patel by launching him for a straight six, before taking him for boundaries through mid-off and point. Taylor swept Daniel Vettori for four, and smote Patel for two leg-side sixes. After having conceded only 23 off the first 13 overs of the day, New Zealand had leaked 41 off the next five. Zimbabwe's offensive forced Patel out of the attack, and in the absence of suitable back-up options, New Zealand turned to debutant Dean Brownlie, whose first-class career consisted of 17 wicket-less overs. Sibanda couldn't have asked for more amiable circumstances to bring up his ton but he needlessly cut a wide trundler straight to gully. Vettori probed away with intent in the lead-up to lunch, and made telling breaches soon after the break. Taylor succumbed attempting to sweep the fourth ball of the middle session, after having survived a straightforward appeal in similar circumstances earlier. Taibu perished in Vettori's next over, charging mindlessly and holing out to mid-on. With the second new ball around the corner, Zimbabwe found themselves in an avoidable mess. The debutant pair of Waller and Regis Chakabva buckled down admirably against Martin's inswing, and Bracewell's tight lines. Only 11 runs came in the 10 overs following Taibu's exit, before Waller smoked Martin through the covers. Vettori was immediately pressed back into service with a newish ball, and Waller welcomed him with a pleasing straight drive, as Zimbabwe averted the follow-on in the 90th over. Vettori continued to attack, with three men close in on the off side, angling in a raft of well-disguised arm-balls. Waller didn't pick them, but battled through by reading him off the pitch. Chakabva, too, gradually opened up, drilling Bracewell down the ground before cutting Vettori through point. Once again, Patel's introduction was met with aggression, as Waller teed off for an extravagant straight six. The advantage veered dramatically towards the visitors after tea, from the moment Chakabva ran himself out attempting a risky second. Ray Price, himself an expert in the art of delivering arm balls, shuffled into one from Vettori to bag a duck. Kyle Jarvis then edged Martin into the slips, before Vettori had Chris Mpofu edging to bat-pad. Waller kept hitting boundaries, but despite his efforts Zimbabwe had lost their last five wickets for 29 when Martin rearranged Njabulo Ncube's stumps with an inswinger. Stumps were in the firing line again five balls later, when first-innings centurion Martin Guptill played all over a straight ball from Jarvis. Kane Williamson survived a couple of tense moments, but Brendon McCullum was not so lucky, trapped in front by Price's first ball, an armer as good as the one he had fallen to. The two blows will stall New Zealand's march towards a declaration, while another early strike or two on the fourth day could leave the game delicately poised.